The story of North American exploration spans an entire millennium andinvolves a wide array of European powers and uniquely American characters. It began with the Vikings’ brief stint in Newfoundland circa 1000 A.D. and continued through England’s colonization of the Atlantic coast in the 17th century, which laid the foundation for the United States of America. The centuries following the European arrivals would see the culmination of this effort, as Americans pushed westward across the continent, enticed by the lure of riches, open land and a desire to fufill the nation’s manifest destiny. The first attempt by Europeans to colonize the New World occurred around a.d. 1000, when the Vikings sailed from the British Isles to Greenland, established a colony, and then moved on to Labrador, the Baffin Islands, and finally Newfoundland. There they established a colony named Vineland (meaning fertile region) and from that base sailed along the coast of North America, observing the flora, fauna, and native peoples. Inexplicably, after a few years Vineland was abandoned. Did you know? Explorer Henry Hudson died when his crew mutinied and left Hudson, his son and seven crew members adrift in a small open boat in the Hudson Bay. Although the Vikings never returned to America, their accomplishments became known to other Europeans. Europe, however, was made up of many small principalities whose concerns were mainly local. 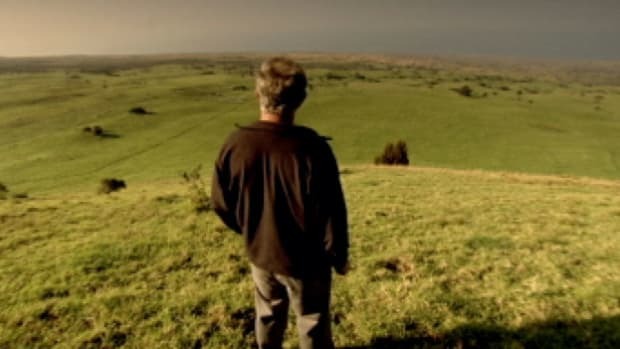 Europeans may have been intrigued by the stories of the feared Vikings’ discovery of a “new world,” but they lacked the resources or the will to follow their path of exploration. Trade continued to revolve around the Mediterranean Sea, as it had for hundreds of years. But between 1000 and 1650 a series of interconnected developments occurred in Europe that provided the impetus for the exploration and subsequent colonization of America. These developments included the Protestant Reformation and the subsequent Catholic Counter-Reformation, the Renaissance, the unification of small states into larger ones with centralized political power, the emergence of new technology in navigation and shipbuilding, and the establishment of overland trade with the East and the accompanying transformation of the medieval economy. The Protestant Reformation and the Catholic church’s response in the Counter-Reformation marked the end of several centuries of gradual erosion of the power of the Catholic church as well as the climax to internal attempts to reform the church. Protestantism emphasized a personal relationship between each individual and God without the need for intercession by the institutional church. In the Renaissance, artists and writers such as Galileo, Machiavelli, and Michelangelo adopted a view of life that stressed humans’ ability to change and control the world. Thus, the rise of Protestantism and the Counter-Reformation, along with the Renaissance, helped foster individualism and create a climate favorable to exploration. At the same time, political centralization ended much of the squabbling and fighting among rival noble families and regions that had characterized the Middle Ages. With the decline of the political power and wealth of the Catholic church, a few rulers gradually solidified their power. Portugal, Spain, France, and England were transformed from small territories into nation-states with centralized authority in the hands of monarchs who were able to direct and finance overseas exploration. As these religious and political changes were occurring, technological innovations in navigation set the stage for exploration. Bigger, faster ships and the invention of navigational devices such as the astrolabe and sextant made extended voyages possible. But the most powerful inducement to exploration was trade. 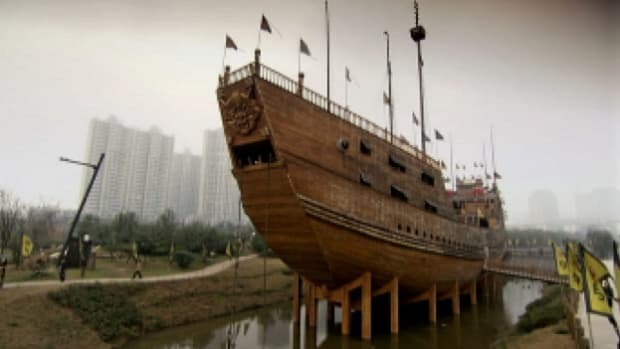 Marco Polo’s famous journey to Cathay signaled Europe’s “discovery” of Chinese and Islamic civilizations. The Orient became a magnet to traders, and exotic products and wealth flowed into Europe. Those who benefited most were merchants who sat astride the great overland trade routes, especially the merchants of the Italian city-states of Genoa, Venice, and Florence. The newly unified states of the Atlantic–France, Spain, England, and Portugal–and their ambitious monarchs were envious of the merchants and princes who dominated the land routes to the East. Moreover, in the latter half of the fifteenth century, war between European states and the Ottoman Empire greatly hampered Europe’s trade with the Orient. The desire to supplant the trade moguls, especially the Italians, and fear of the Ottoman Empire forced the Atlantic nations to search for a new route to the East. Portugal led the others into exploration. Encouraged by Prince Henry the Navigator, Portuguese seamen sailed southward along the African coast, seeking a water route to the East. They were also looking for a legendary king named Prester John who had supposedly built a Christian stronghold somewhere in northwestern Africa. Henry hoped to form an alliance with Prester John to fight the Muslims. During Henry’s lifetime the Portuguese learned much about the African coastal area. His school developed the quadrant, the cross-staff, and the compass, made advances in cartography, and designed and built highly maneuverable little ships known as caravels. After Henry’s death, Portuguese interest in long-distance trade and expansion waned until King John II commissioned Bartolomeu Dias to find a water route to India in 1487. Dias sailed around the tip of Africa and into the Indian Ocean before his frightened crew forced him to give up the quest. A year later, Vasco da Gama succeeded in reaching India and returned to Portugal laden with jewels and spices. 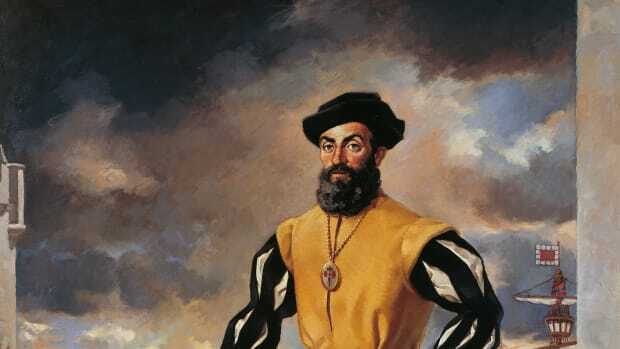 In 1500 Pedro Álvares Cabral discovered and claimed Brazil for Portugal, and other Portuguese captains established trading posts in the South China Sea, the Bay of Bengal, and the Arabian Sea. These water routes to the East undercut the power of the Italian city-states, and Lisbon became Europe’s new trade capital. Spain’s imperial ambitions were launched by Christopher Columbus. 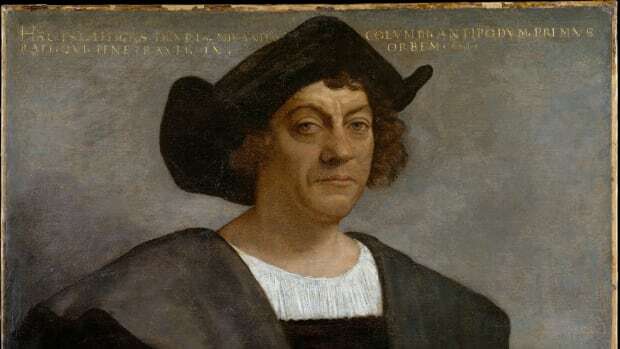 Born in Genoa, Italy, around 1451, Columbus learned the art of navigation on voyages in the Mediterranean and the Atlantic. At some point he probably read Cardinal Pierre d’Ailly’s early fifteenth-century work, Imago mundi, which argued that the East could be found by sailing west of the Azores for a few days. 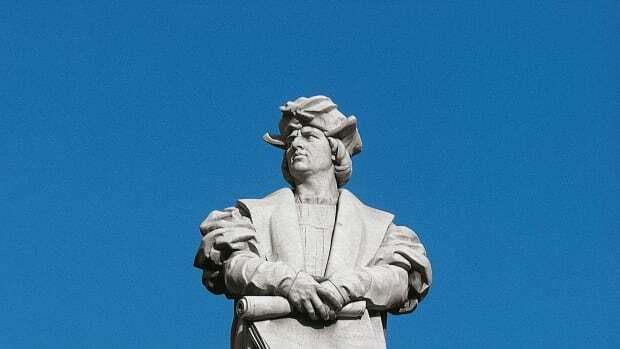 Columbus, hoping to make such a voyage, spent years seeking a sponsor and finally found one in Ferdinand and Isabella of Spain after they defeated the Moors and could turn their attention to other projects. In August 1492, Columbus sailed west with his now famous ships, Niña, Pinta, and Santa María. After ten weeks he sighted an island in the Bahamas, which he named San Salvador. Thinking he had found islands near Japan, he sailed on until he reached Cuba (which he thought was mainland China) and later Haiti. Columbus returned to Spain with many products unknown to Europe–coconuts, tobacco, sweet corn, potatoes–and with tales of dark-skinned native peoples whom he called “Indians” because he assumed he had been sailing in the Indian Ocean. Although Columbus found no gold or silver, he was hailed by Spain and much of Europe as the discoverer of d’Ailly’s western route to the East. John II of Portugal, however, believed Columbus had discovered islands in the Atlantic already claimed by Portugal and took the matter to Pope Alexander II. Twice the pope issued decrees supporting Spain’s claim to Columbus’s discoveries. But the territorial disputes between Portugal and Spain were not resolved until 1494 when they signed the Treaty of Tordesillas, which drew a line 370 leagues west of the Azores as the demarcation between the two empires. More Spanish expeditions followed. Juan Ponce de León explored the coasts of Florida in 1513. 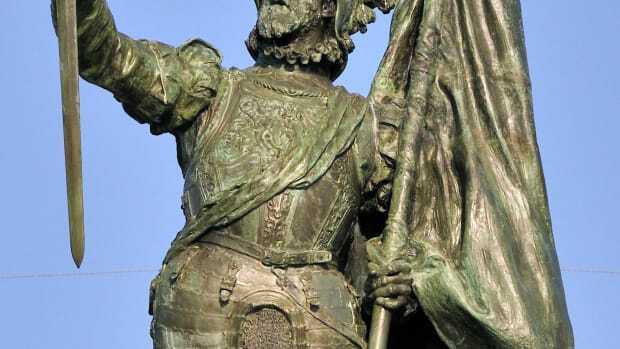 Vasco Núñez de Balboa crossed the Isthmus of Panama and discovered the Pacific Ocean in the same year. Ferdinand Magellan’s expedition (in the course of which he put down a mutiny and was later killed) sailed around the tip of South America, across the Pacific to the Philippines, through the Indian Ocean, and back to Europe around the southern tip of Africa between 1519 and 1522. Two expeditions led directly to Spain’s emergence as sixteenth-century Europe’s wealthiest and most powerful nation. The first was headed by Hernando Cortés, who in 1519 led a small army of Spanish and Native Americans against the Aztec Empire of Mexico. Completing the conquest in 1521, Cortés took control of the Aztecs’ fabulous gold and silver mines. 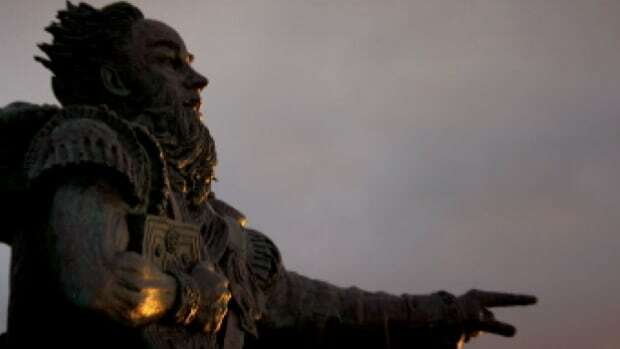 Ten years later, an expedition under Francisco Pizarro overwhelmed the Inca Empire of Peru, securing for the Spaniards the great Inca silver mines of Potosí. In 1535 and 1536 Pedro de Mendoza went as far as present-day Buenos Aires in Argentina, where he founded a colony. At the same time, Cabeza de Vaca explored the North American Southwest, adding that region to Spain’s New World empire. 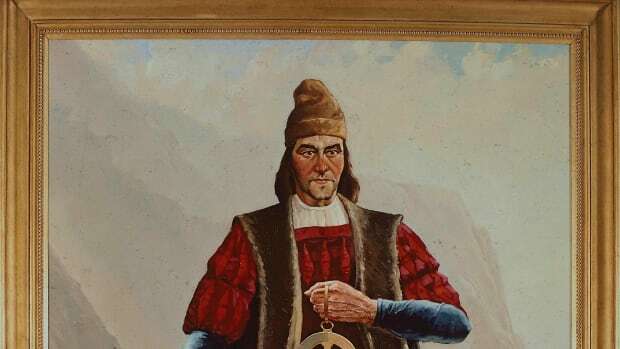 A few years later (1539-1542) Francisco Vásquez de Coronado discovered the Grand Canyon and journeyed through much of the Southwest looking for gold and the legendary Seven Cities of Cíbola. 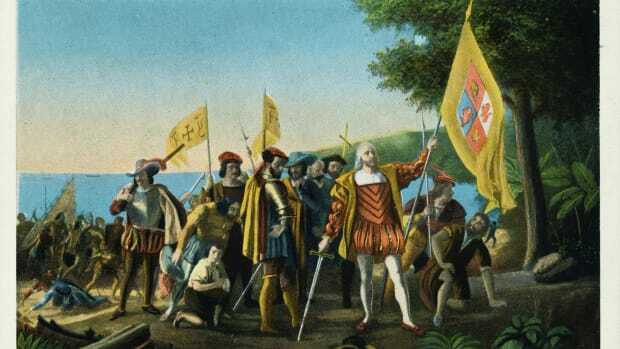 About the same time Hernando de Soto explored southeastern North America from Florida to the Mississippi River. By 1650 Spain’s empire was complete and fleets of ships were carrying the plunder back to Spain. The impulse for exploration was further fueled by the European imagination. The idea of “America” antedated America’s discovery and even Viking exploration. That idea had two parts: one paradisiacal and utopian; the other savage and dangerous. Ancient tales described distant civilizations, usually to the west, where European-like peoples lived simple, virtuous lives without war, famine, disease, or poverty. Such utopian visions were reinforced by religious notions. Early Christian Europeans had inherited from the Jews a powerful prophetic tradition that drew upon apocalyptic biblical texts in the books of Daniel, Isaiah, and Revelations. They connected the Christianization of the world with the second coming of Christ. Such ideas led many Europeans (including Columbus) to believe it was God’s plan for Christians to convert pagans wherever they were found. If secular and religious traditions evoked utopian visions of the New World, they also induced nightmares. The ancients described wonderful civilizations, but barbaric, evil ones as well. 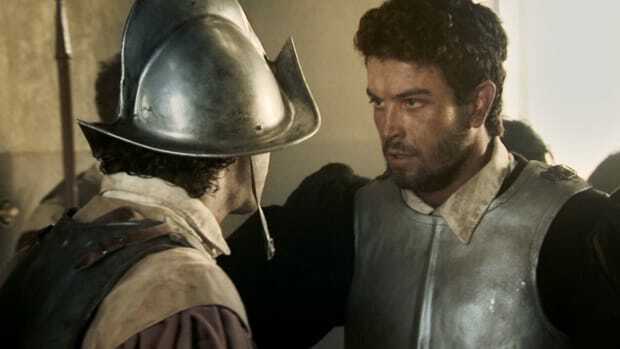 Moreover, late medieval Christianity inherited a rich tradition of hatred for non-Christians derived in part from the Crusaders’ struggle to free the Holy Land and from warfare against the Moors. European encounters with the New World were viewed in light of these preconceived notions. To plunder the New World of its treasures was acceptable because it was populated by pagans. To Christianize the pagans was necessary because it was part of God’s plan; to kill them was right because they were Satan’s or Antichrist’s warriors. As European powers conquered the territories of the New World, they justified wars against Native Americans and the destruction of their cultures as a fulfillment of the European secular and religious vision of the New World. While Spain was building its New World empire, France was also exploring the Americas. 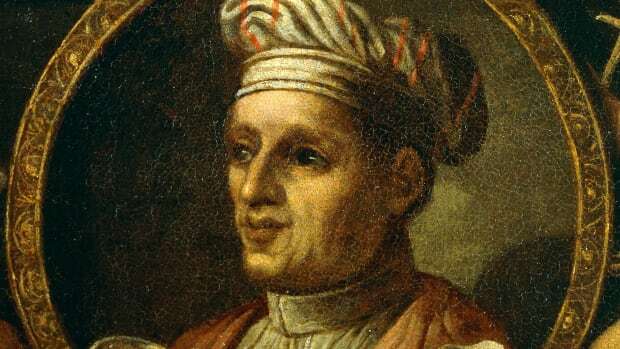 In 1524, Giovanni da Verrazano was commissioned to locate a northwest passage around North America to India. He was followed in 1534 by Jacques Cartier, who explored the St. Lawrence River as far as present-day Montreal. In 1562 Jean Ribault headed an expedition that explored the St. Johns River area in Florida. His efforts were followed two years later by a second venture headed by René de Laudonnière. But the Spanish soon pushed the French out of Florida, and thereafter, the French directed their efforts north and west. In 1608 Samuel de Champlain built a fort at Quebec and explored the area north to Port Royal, Nova Scotia, and south to Cape Cod. Unlike Spain’s empire, “New France” produced no caches of gold and silver. Instead, the French traded with inland tribes for furs and fished off the coast of Newfoundland. New France was sparsely populated by trappers and missionaries and dotted with military forts and trading posts. Although the French sought to colonize the area, the growth of settlements was stifled by inconsistent policies. Initially, France encouraged colonization by granting charters to fur-trading companies. Then, under Cardinal Richelieu, control of the empire was put in the hands of the government-sponsored Company of New France. The company, however, was not successful, and in 1663 the king took direct control of New France. 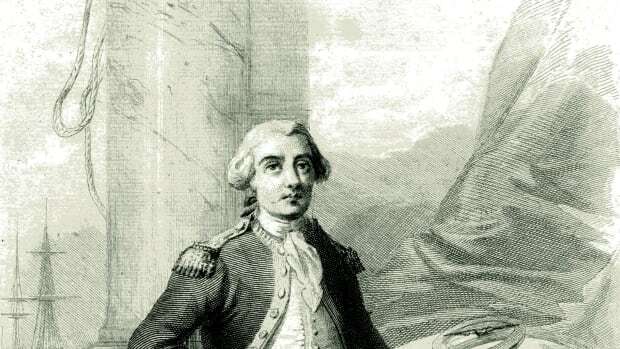 Although more prosperous under this administration, the French empire failed to match the wealth of New Spain or the growth of neighboring British colonies. The Dutch were also engaged in the exploration of America. Formerly a Protestant province of Spain, the Netherlands was determined to become a commercial power and saw exploration as a means to that end. In 1609, Henry Hudson led an expedition to America for the Dutch East India Company and laid claim to the area along the Hudson River as far as present-day Albany. In 1614 the newly formed New Netherland Company obtained a grant from the Dutch government for the territory between New France and Virginia. About ten years later another trading company, the West India Company, settled groups of colonists on Manhattan Island and at Fort Orange. The Dutch also planted trading colonies in the West Indies. 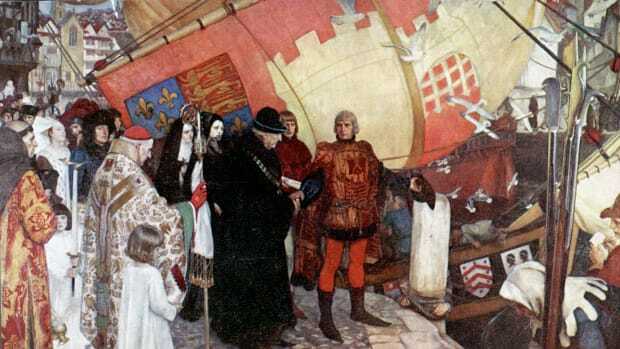 In 1497 Henry VII of England sponsored an expedition to the New World headed by John Cabot, who explored a part of Newfoundland and reported an abundance of fish. But until Queen Elizabeth’s reign, the English showed little interest in exploration, being preoccupied with their European trade and establishing control over the British Isles. By the mid-sixteenth century, however, England had recognized the advantages of trade with the East, and in 1560 English merchants enlisted Martin Frobisher to search for a northwest passage to India. Between 1576 and 1578 Frobisher as well as John Davis explored along the Atlantic coast. Thereafter, Queen Elizabeth granted charters to Sir Humphrey Gilbert and Sir Walter Raleigh to colonize America. Gilbert headed two trips to the New World. He landed on Newfoundland but was unable to carry out his intention of establishing military posts. A year later, Raleigh sent a company to explore territory he named Virginia after Elizabeth, the “Virgin Queen,” and in 1585, he sponsored a second voyage, this time to explore the Chesapeake Bay region. By the seventeenth century, the English had taken the lead in colonizing North America, establishing settlements all along the Atlantic coast and in the West Indies. Sweden and Denmark also succumbed to the attractions of America, although to a lesser extent. In 1638 the Swedish West India Company established a settlement on the Delaware River near present-day Wilmington called Fort Christina. This colony was short-lived, however, and was taken over by the Dutch in 1655. The king of Denmark chartered the Danish West India Company in 1671, and the Danes established colonies in St. Croix and other islands in the cluster of the Virgin Islands. Samuel Eliot Morison, The European Discovery of America: The Northern Voyages, a.d. 500-1600 (1971); John H. Parry, The Spanish Seaborne Empire (1966; 2nd ed., 1980); David B. Quinn, England and the Discovery of America, 1481-1620, from the Bristol Voyages of the Fifteenth Century to the Pilgrim Settlement at Plymouth: The Exploration, Exploitation, and Trial-and-Error Colonization of North America by the English (1974).